Day 1: Deck before demolition. Delaney and Nancy live in a handsome old house in the Glebe, one of Ottawa’s more desirable neighbourhoods. 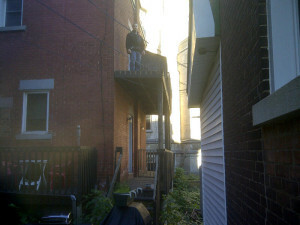 But, their two-storey deck has seen better days. 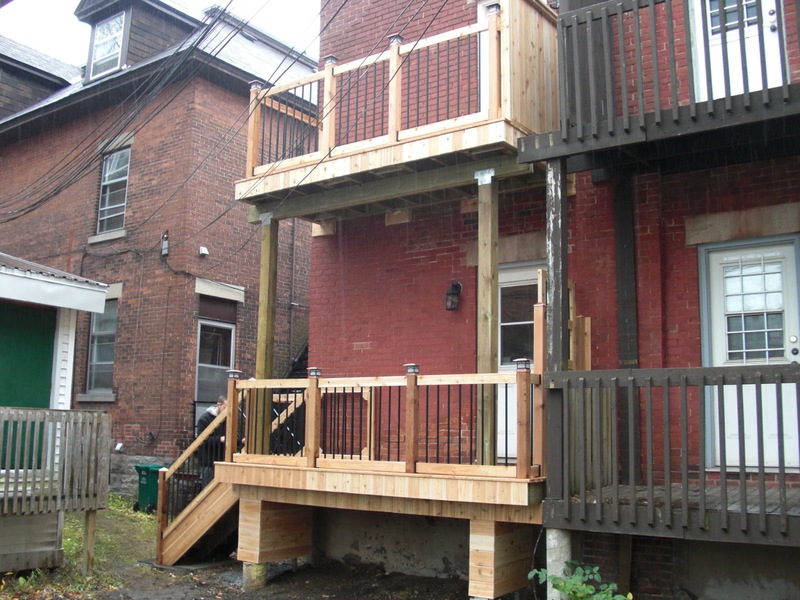 With engineer drawings and permits approved by the City, we’re spending the next two weeks removing the old deck and building a new one. 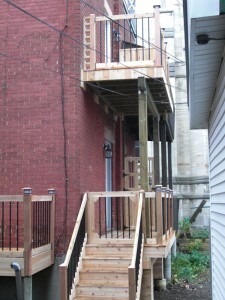 The deck will have pressure treated timber for the frame and cedar for the boards and hand rail. We’ll also be adding a window on the second level, where there isn’t currently one. Day 2: Today was everyone’s favourite task. We dug two 6-foot-deep, 2.5-foot-wide holes by hand. Being competitive, Don and I raced to see who’d finish first. It was a gruelling 2.5 hours of digging and I won. 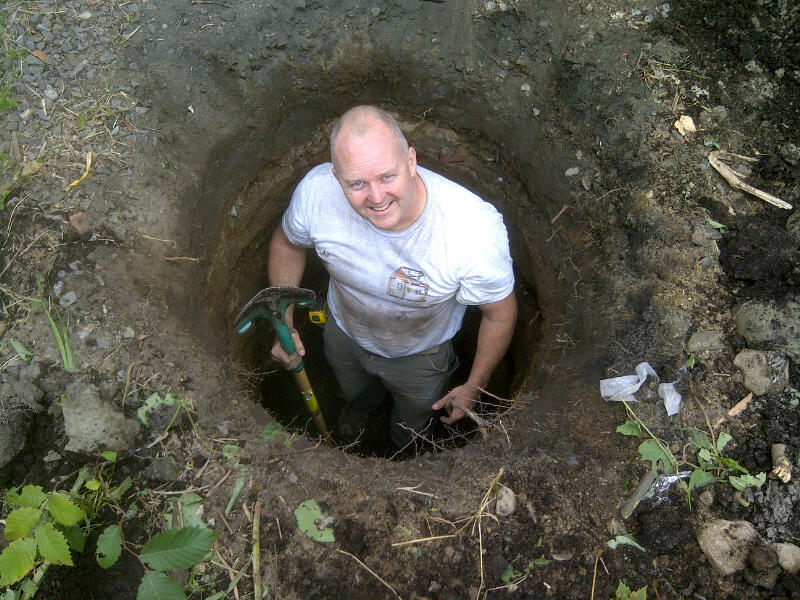 The city inspector approved our work and was incredulous that we’d dug the holes manually. 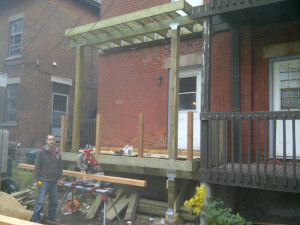 Day 3: The deck will be supported by posts on one side and braced against the house on the other side. We opened up the house exterior today and discovered poured concrete instead of the wood rim joist anticipated by the engineer’s drawings. Full work stop. 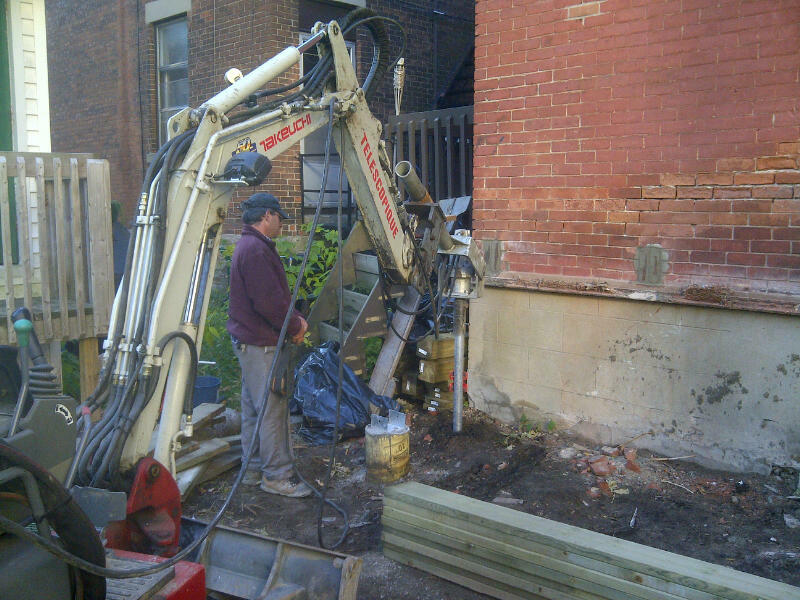 Postech putting in screw pile. Day 8: One week and dozens of phone calls later. The concrete’s composition isn’t strong enough to support the deck, so new drawings call for metal screw piles near the house foundation to support the deck. Postech came this morning and we’re moving forward with deck building. Days 9 – 11: Building the deck is full steam ahead. 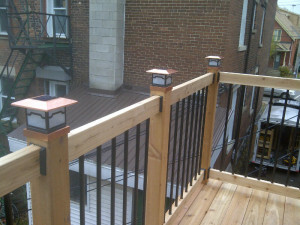 Both levels, the handrails and stairs are built, and have been inspected by the City. The inspector was impressed with how solid the deck is — doesn’t budge an inch. Nancy keeps sending me happy text messages. Love happy clients. outdoors. Built this gate in my basement. Day 12: Mother Nature sent rain today and it’s not safe to use power tools outdoors. 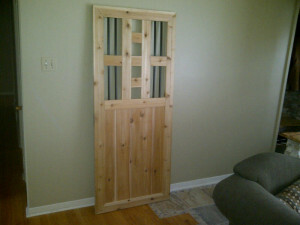 So, I built the deck gate in my basement. 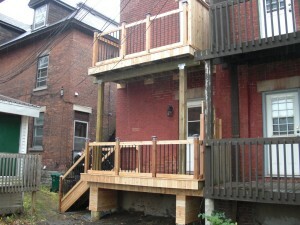 The deck is complete and all approved by the City inspector. Delaney and Nancy had before. 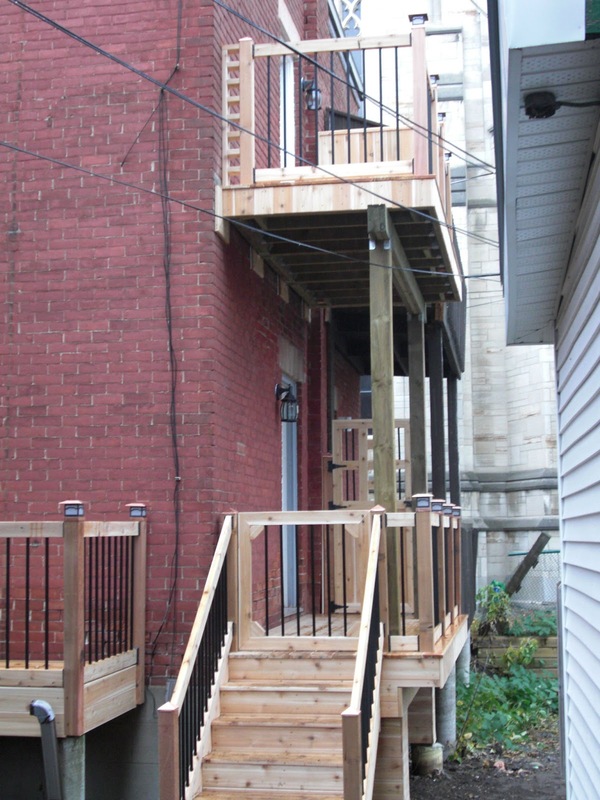 Delaney and Nancy both shared renovation photos on their Facebook pages and kindly recommended us to their friends.